The Premack Principle: It states that for any two behaviors, the one that’s more likely (or that your dog prefers) can reinforce, or strengthen, the one that’s less likely (and that you might prefer). Instead of trying to get our dogs to ignore whatever excites and distracts them, we can use those excitements and distractions as rewards. I have read about The Premack Principle and watched several YouTube videos but on Tuesday for the first time I had some hands-on experience with Sarah showing me how to use it when Boogie becomes fixated on something and pulls on the leash.The high distraction environment that we were in – Cheviot Park – was perfect for this exercise because Boogie was pulling me all over the place. The smell of squirrel was everywhere. And so it goes that the more often that I let Boogie ignore me, the more that I am enabling his “bad behavior” and he’ll just continue to blow me off whenever he feels like it. 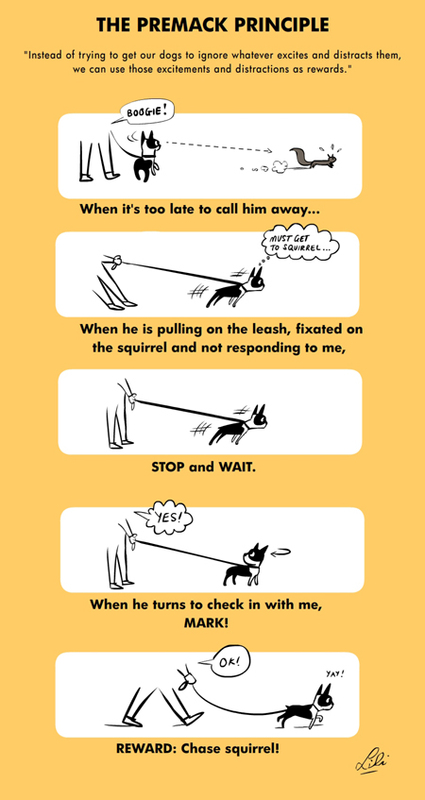 Scolding or dragging Boogie away on the leash does not solve the problem. When Boogie pulls, note where he wants to go. STOP. Stand still. Do not let myself be pulled forwards. …And I let him go where he wants to go. Q: What if Boogie doesn’t turn around to check with me? What if he remains frozen or locked in that pulling forward position and won’t respond at all? A: Initially we wait to mark the smallest behaviors, like an ear flick, or even if he turns his body slightly. We don’t expect a full head turn or eye contact straight away. 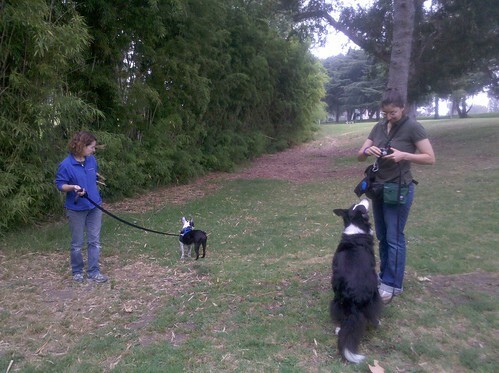 This “splitting of behaviors into small steps” is a key feature of the Clicker Training process. Q: What if, 5 minutes later, Boogie still remains locked and offers no signals? Q: What if I really really don’t want to go where he wants to go? A more impressive moment was when Franklin moved quickly towards Boogie with direct eye contact, and Boogie instantly offered a lip lick (calming signal) and turned away. YAY! A big thank you to Irith and Franklin for being there on Tuesday! I hope that we can organize a Boogie & Franklin playdate some day… Who wants to lend us a fenced yard? 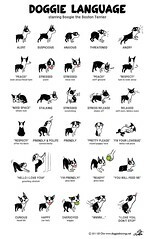 Irith’s The Sophisticated Dog facebook page has some great articles on dog training. Entry filed under: Articles, links, BAT sessions, Outdoors, Training. Hair loss and crusty dry skin... What is it? What Is My Dog's Poo Telling Me?